One of the area's most significant private sources of public education funding will be adding another major initiative to its plate this year: reforming the way Southeast Tennessee and North Georgia residents eat. The Benwood Foundation's three-year, $1.65 million investment will launch Gaining Ground, a movement to establish a local food economy and link more consumers with regional producers of eggs, meat, fruits and vegetables. "Local food is fresher," said Jeff Pfitzer, program director for Gaining Ground at the Benwood Foundation. "You are reducing the environmental impact of transportation. It strengthens the local economy. Fresh food is more nutritious, and most people would agree it just plain old tastes better." Born out of an 18-month study, Gaining Ground signifies an important shift in the Benwood Foundation's financial investments and could put Chattanooga on the cutting edge of locally supported farming, officials said. Since 2000, Benwood has put nearly $16 million, or 35 percent of its grant funding, into innovative educational programs at local schools. The plan dictating those investments is operational until 2012, but it's changing as new community needs, such as improving the link between food growers and consumers, are identified, Mr. Pfitzer said. "I think one thing you will find about a good foundation is that they are always adaptable," said Corinne Allen, executive director of the Benwood Foundation. "We have been involved in education a long time, but we are transitioning to new opportunities for the foundation. ... What you are seeing is a shift." Issues revolving around childhood obesity, energy costs, food safety and struggling local economies have put the development of sustainable agriculture and local food systems on the national radar in recent years. And replacing international food sources with community food sources has been a new priority for the U.S. Department of Agriculture, which is putting billions of dollars annually into grants and loans to reinvigorate local food systems. Weekly open-air markets, local grocers such as Greenlife Grocery and Earth Fare and community-supported agriculture programs have made local produce accessible to the masses. Still, many in the Chattanooga area are unaware of the benefit to eating food grown down the street, officials said, and farmers have struggled to band together and get the message out. 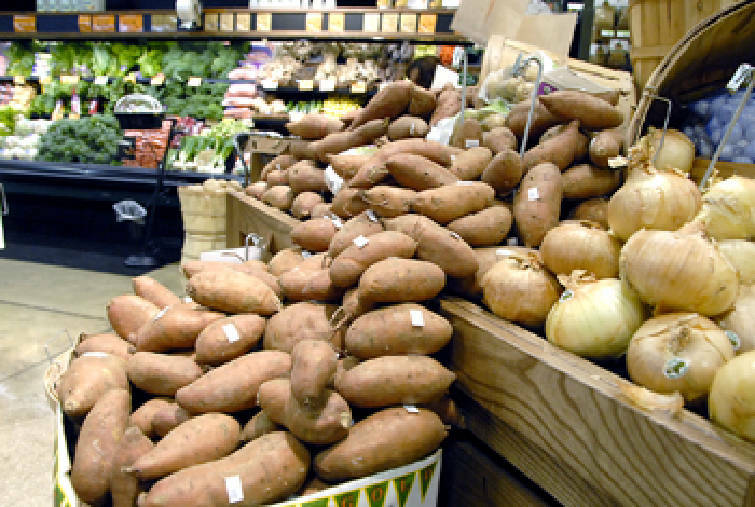 Staff photo by Matt Fields-Johnson/Chattanooga Times Free Press Sweet potatoes from Asheville, N.C., are sold at EarthFare Supermarket on Gunbarrel Road. There are more than 1,500 farms within a 100-miles radius of Chattanooga -- valued at around $7.4 million -- that could contribute to a local food system, according the last agriculture census by the U.S. Department of Agriculture. One-quarter of a percent of total food sales are from these regional farms, Mr. Pfitzer said. "That just shows how little of our food economy is supporting local farmers," he said. A 5 percent increase in home-grown food purchasing would generate $100 million for the local economy annually, according to a study by the Ochs Center for Metropolitan Studies at the University of Tennessee at Chattanooga. "That is no small thing when we are in economic hard times," Mr. Pfitzer said. Benwood's food movement, which is not limited to organic produce, will try to bring some cohesiveness among food producers, grass-roots organizations and local government agencies. Farmers will get help with marketing, diversifying and expanding their farms, officials said. Grants also will be given to the Hamilton County Department of Education for some targeted schools to use local produce to create more nutritional meal offerings for students, Mr. Pfitzer said. "We will be making grants that address childhood obesity and increase the amount of fresh food for targeted elementary schools," he said. Regional farmers say the backing of Gaining Ground will energize an already-growing community of producers and consumers passionate about homegrown produce. Staff Photo by Angela Lewis/Chattanooga Times Free Press Tiffany Branum weeds the covered tomato garden Thursday at Crabtree Farms. Plants and produce from the garden are sold in the area throughout the growing season. Mitch Lawson, owner of Rise N Shine Farms in Calhoun, Ga., grows more than 40 different types of fruits and vegetables on eight acres and said he wants to expand his operations and learn more effective ways to reach buyers. "I think (Gaining Ground) would be great, something that would help expand our industry and business," Mr. Lawson said. "On my end, I am pretty much tapped out as far as what I can provide." Mr. Lawson sells some produce to Greenlife Grocery, but 90 percent of his produce is sold through community-supported agriculture programs. The programs allow people to sign up for one year of fresh produce given out on a weekly basis. In Mr. Lawson's program, a full share for a 30-week season that can feed a small family costs $800 a year, while a half share is $450 a year. "I have people that say they don't like turnip and beets and then they eat ours and they love it," Mr. Lawson said. "Their children eat vegetables they wouldn't have touched before because they have a story to them."